Let me begin by saying that running 26.2 miles is something I never would have ever thought I could do, even one year ago. When I started this blog, running half marathons, and toying with the idea of running a full marathon, I still didn’t believe I would actually run the marathon. When I started training for the marathon four months ago, I entered each week expecting that something would go wrong. An injury, a life complication, sheer exhaustion. 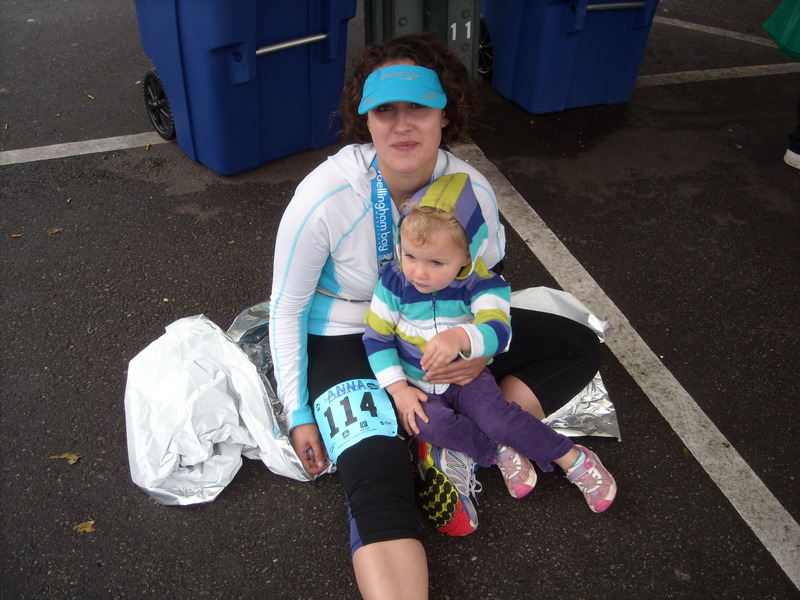 Running this marathon was a culminating exercise in proving this negative thoughts WRONG! Because, today, I am a marathoner. And similarly to crossing any threshold requiring a labor of love, from completing a thesis to birthing a child, I stand on the other side a changed person. 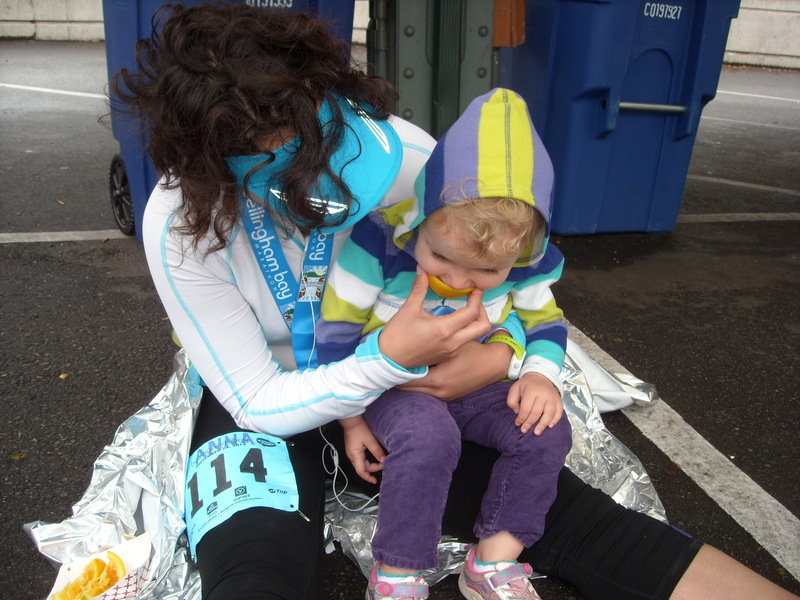 I am a different runner now… but so much more. With the knowledge that I completed 26.2 miles inside of me, so much more seems possible. If you ever wonder about running a marathon, stop wondering… make it happen. Trust me, if I can do it, you most certainly can. I ran this race with the same friend that I ran my first half with exactly a year ago (same marathon event). I woke up at 4:30 in the morning to greet her by 5:45 and head to the race start. Meanwhile, Bellingham was beginning to experience the beginning of a wind and rain storm that is poised to set a September record. The wind was howling all throughout the night before the race, rain was beating mercilessly, and branches were falling from trees. So by 6:30 in the morning of race day, conditions were a bit bleak. Thankfully, the starting line was at a tribal school and they opened their huge warm gym to us. There were indoor toilets, and hot beverages. Had my stomach been calmer, I might have enjoyed some coffee! After I encountered Father Marathon, I ran a few miles lost in my concentration. At some point in the middle, I planned to change my socks for another pair. It was wet and I wanted to avoid blisters. I got to a tent around Mile 15, and I asked to sit and change my socks. An angel disguised as a race volunteer not only sat me down but actually changed my socks and bandaged the tender parts of my feet. She was so kind. 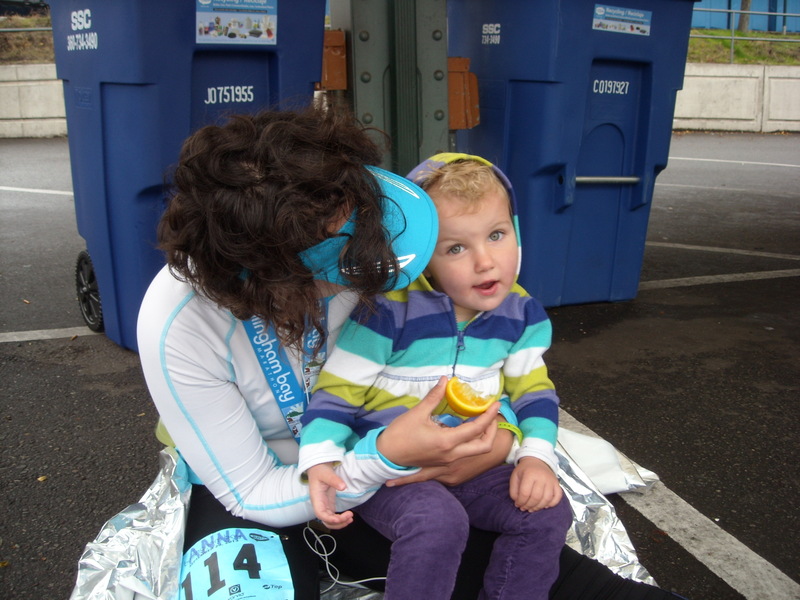 She looked me in the eye and gave me such a needed pep talk, because by Mile 15, I was getting very tired and cold. Miles 15-18 were the hardest for me. There wasn’t an end in sight, and I started to hit the wall… big time. My running buddy was so supportive and talked me through the wall. In fact, many times during the 5+ hours we ran together, we seemed to have alternating strength to get the other through weakness. I could not have run this marathon alone. At Mile 17, we connected with the half marathon course, and by Mile 18 I was in very familiar territory. I think the last 8 miles were manageable because I had followed those routes so many times on training runs. I was starting to get hungry… very hungry. And the thought of another GU made me wretch. Enter: Marathon angel number two. A woman was dancing in front of her house cheering us on. She had put (still warm) chocolate oatmeal cookies in plastic bags and hung them from a tree. “Have a cookie!” she yelled. I grabbed that bag and I ran with it, gleefully all the way to Mile 20. That cookie saved my marathon. It was just the right combination of warm, salty, and sugary to give me that extra boost. They say the real marathon is miles 20-26, and in my case those were not the most difficult, but the most time consuming. I walked more. I was starting to get stiff and cold. At Mile 24, I started to get that lovely GI rumble and cramping, a pain which other long distance runners know all too well. I listened to my music (I listened to none the first 13 miles, but eventually needed some added stimulation), and got through the last two miles of rolling hills. I rounded the bend… and I saw the finish line. The act of actually doing the thing I had imagined all summer in my positive thinking exercises was overwhelming. I couldn’t read the clock because my eyes were already faucets. I saw my best friend running buddy crying on the sidelines waiting for me and I just lost it. I sobbed through that finish line! My race buddy and I hugged each other and had our cry. Family and friends surrounded us as we waddled to the food/stretching area. I couldn’t get over how tired I was and how happy I was. Accomplishment for something I’ve worked so hard for… this is what it feels like. It feels like rebirth. Will I run another marathon? I know I will. And now, I know I can! What an empowering story! You have such focus, determination, and discipline. We are very, very proud of you! Cheers!! I am looking at the Vancouver marathon in early May. Oh wow! Very inspiring recap. 🙂 I’m really just amazed that you carried yourself such a great distance, and in such dismal conditions– you rock! Congratulations! What an amazing accomplishment! 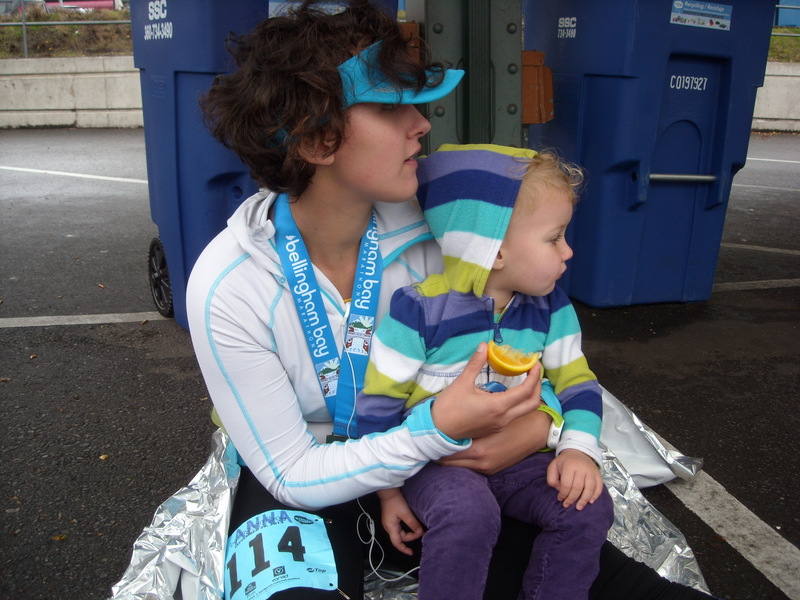 As a fellow running mama (although I’m just up to a couple miles after giving birth – nowhere near 26.2!!) this is truly inspiring. I’m so happy for you and proud of you (is that weird?). It is SUCH a difficult journey. It sounds like you traveled it with grace, tenacity, love, and perseverance. Good for you!!! Those oatmeal cookies sound like they were sent straight from heaven!